Anasept® Antimicrobial Skin and Wound Cleanser is a clear, isotonic liquid that helps in the mechanical removal of the debris from the application site; while delivering 0.057% broad spectrum antimicrobial sodium hypochlorite. Anasept® also inhibits the growth of bacteria such as Staphylococcus aureus, Psuedomonas aeruginosa, Escherichia coli, Proteus mirabilis, Serratia marcescens, Acinetobacter baumannii, Clostridium difficile and antibiotic resistant Methicillin Resistant Staphylococcus aureus (MRSA), Vancomycin resistant Enterococcus faecalis (VRE), and Carbapenem Resistant Escherichia coli (CRE) that are commonly found in wound bed as well as fungi such as Candida albicans and Aspergillus niger. 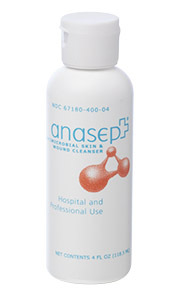 Anasept® Antimicrobial Skin and Wound Cleanser is intended for use under the supervision of a healthcare professional for cleansing of foreign materials including micro-organisms from wounds such as stage I-IV pressure ulcers, diabetic foot ulcers, post surgical wounds, first and second degree burns, grafted and donor sites.